I recently received several documents that contained multiple (and irregular) numbers of spaces between each word. When I asked the original author about this, they said that they typed out the document and that they struggle with the gap a space produces being too small. As I was meant to extract the information out of these documents and use it in a report and create a spreadsheet out of these I wanted to get rid of the multiple spaces so that I wouldn't have to re-type the whole thing. Microsoft office offers several ways to do this, however many of them do not work with OpenOffice or LibreOffice. This is such a simple problem, but there are not many solutions to this shown online. A simple fix is to use the Find & Replace tool (Ctrl + H or edit > Find & Replace from the top menu). This will bring up a window (shown below). In the Search for field enter [:space:]+ (be sure to include the symbols) and then in the Replace With field put in a space. 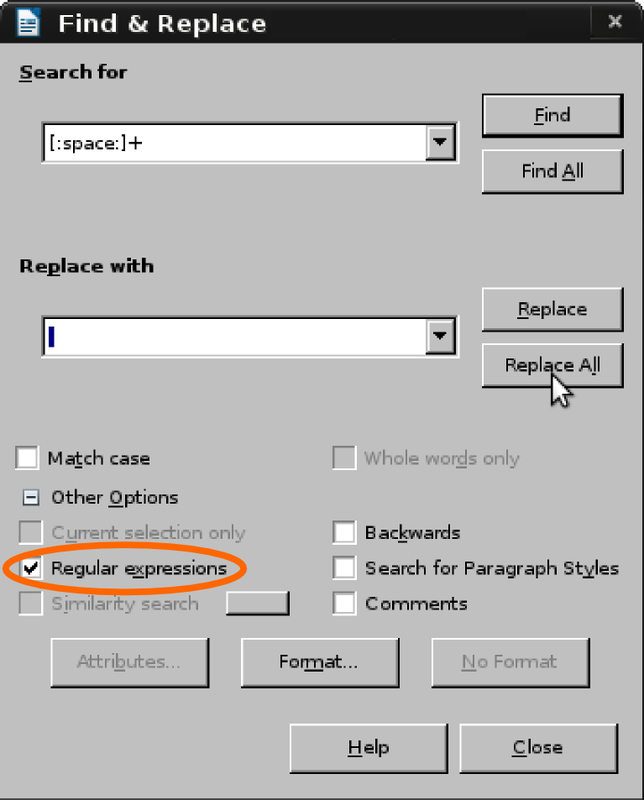 Click on the + symbol beside Other Options and select Regular expressions ( a tick should appear in the box beside it. Click on Replace All and your document should now be sorted, all of the multiple spaces will be replaced by a single space.